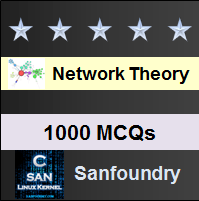 This set of Network Theory Multiple Choice Questions & Answers (MCQs) focuses on “Maximum Power Transfer Theorem”. 1. The maximum power is delivered from a source to its load when the load resistance is ______ the source resistance. Explanation: The maximum power is delivered from a source to its load when the load resistance is equal to the source resistance. The maximum power transfer theorem can be applied to both dc and ac circuits. 2. If source impedance is complex, then maximum power transfer occurs when the load impedance is _______ the source impedance. Explanation: The maximum power transfer theorem can be applied to complex impedance circuits. If source impedance is complex, the maximum power transfer occurs when the load impedance is complex conjugate of the source impedance. 3. If the source impedance is complex, then the condition for maximum power transfer is? Explanation: The maximum power is transferred when the load resistance is equal to the source resistance. The condition for maximum power transfer is ZL = ZS*. 4. If ZL = ZS*, then? Explanation: If ZL = ZS*, then RL = RS. This means that the maximum power transfer occurs when the load impedance is equal to the complex conjugate of source impedance ZS. 5. For ZL = ZS*, the relation between XL and XS is? Explanation: For ZL = ZS*, the relation between XL and XS is XL = -XS. Maximum power transfer is not always desirable since the transfer occurs at a 50 percent efficiency. 6. In the circuit shown below, find the value of load impedance for which source delivers maximum power. Explanation: The maximum power transfer occurs when the load impedance is equal to the complex conjugate of source impedance ZS. ZL = ZS* = (15-j20) Ω. 7. The load current in the circuit shown in the question 6 is? Explanation: The load current is the ratio of voltage to the impedance. So the load current is I=(50∠0o)/(15+j20+15-j20) =1.66∠0o A. 8. The maximum power delivered by the source in the circuit shown in the question 6 is? Explanation: The term power is defined as the product of the square of current and the impedance. So the maximum power delivered by the source in the circuit is P = I2RxZ = 1.662×15 = 41.33W. 9. 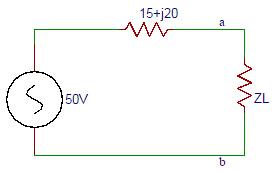 For the circuit shown, the resistance R is variable from 2Ω to 50Ω. 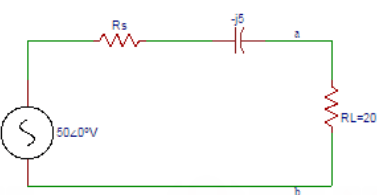 What value of RS results in maximum power transfer across terminals ‘ab’. Explanation: As RL is fixed, the maximum power transfer theorem does not apply. Maximum current flows in the circuit when RS is minimum. So RS = 2Ω. 10. Find the maximum power delivered by the source in the circuit shown in the question 9. Explanation: ZT = RS – j5+ RL = 2-j5+20 = 22.56∠-12.8⁰Ω. I=VS/ZT = -50∠0⁰/22.56∠-12.8⁰ = 2.22∠-12.8⁰A. P = I2R= 2.222×20=98.6W.